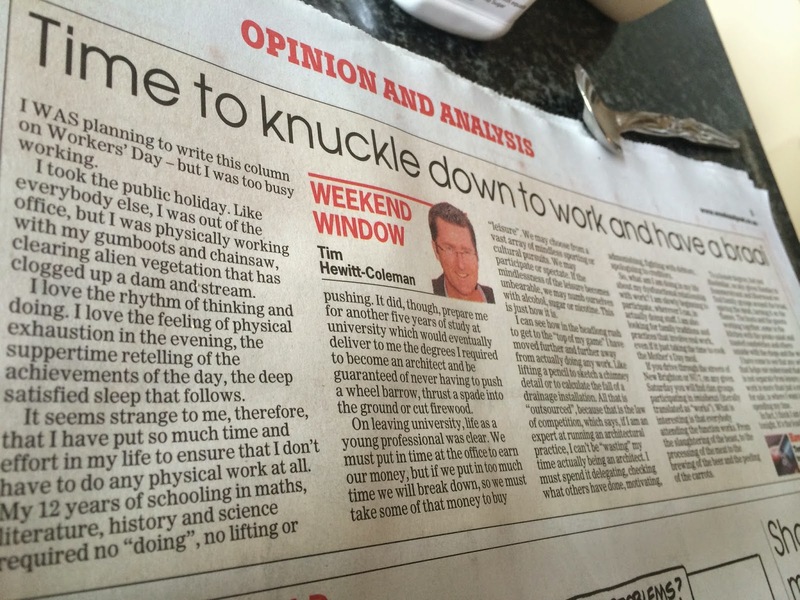 I was planning to write this column on Workers Day, but I was too busy working. Make no mistake, I took the public holiday. Like everybody else, I was out of the office, but I was physically working with my gumboots and my chainsaw, clearing alien vegetation that has come to clog up the dam and the stream. Call me crazy, but I love to do physical work. I love the feeling of using my muscles, my arms and my legs. I love the rhythm of thinking and doing. I love the feeling of physical exhaustion in the evening. I love the supper time retelling of the achievements of the day and I Iove the deep satisfied sleep that follows it. It seems strange to me therefore, that I have put so much time and effort in my life to ensure that I don’t have to do any physical work at all. My twelve years of schooling in maths, literature, history and science required no “doing”, no lifting or pushing. It did though; prepare me for another five years of study at University which would eventually deliver to me the degrees I required to become an Architect and be guaranteed of never having to push a wheel barrow, thrust a spade into the ground or cut firewood. I can see how in the headlong rush to get to the ‘top of my game” I have moved further and further in my career, away from actually doing any work. Like lifting a pencil, to sketch a chimney detail or calculating the fall and cover of a drainage installation. All of that is “outsourced”, because that is the law of competition and the law of competition says that, if I am an expert at running an architectural practice, I can’t be “wasting” my time actually being an Architect. I must spend my time delegating , checking what others have done, motivating, admonishing, fighting with debtors, apologising to creditors because that’s what we do when we get to the top of our game. So, what I am doing in my life about my dysfunctional relationship with work? I suppose, I am slowly beginning to participate, wherever I can, in actually doing stuff. I am also looking for family traditions and practices that involve real work, even if it just taking the time to cook the mother’s day meal. Some families in our region are fortunate to belong to a tradition where work is still honoured. If you drive through the streets of New Brighton or NU 7, on any given Saturday you will find clan groups participating in “Imisibenzi” (literally translated as “works”). These traditional functions mark a range of special occasions, but what is interesting, is that everybody attending the function, works. From the slaughtering of the beast, to the processing of the meat to the brewing of the beer and the peeling of the carrots. Hosts and guests work together. Honouring tradition and honouring the idea of work and how it is in fact not separate from leisure. To a lesser degree, but not entirely dissimilar, on any given Sunday in the suburban backyards of Summerstrand and Sherwood we find family groups around the braai, spicing the meat, turning it on the flames. The hosts and the guests working together, some in the kitchen with the potato salad and toasted sandwiches and others outside with the chops and the wors. These are important traditions to hold onto, where the tendency is toward the American situation where 43% of all meals are no longer prepared at home and where work is generally regarded as something you sell in exchange for cash. In fact, I think I am going to braai tonight. It’s the least I can do! Next Next post: "Fullness of Health", for me, my family and for the Land.